Will she finally take a new step and realize she’s already a butterfly? Or will she remain inside the cocoon in pain, thinking that she would die a caterpillar? Please help me her, whisper to her and be the flowers waiting for her gentle touch. ~ by Asian Butterfly on January 24, 2010. Thank you DOraz, and I am hoping I’d be able to escape in my own cocoon. The way you have brought out the message from the two poems is worth applauding. I must say you are a great human being besides being a good poet/writer. Yes you have inspired me too for stepping out of my comfort zone and try and do things which I always wanted to do but was afraid . Thanks mate for the lesson . 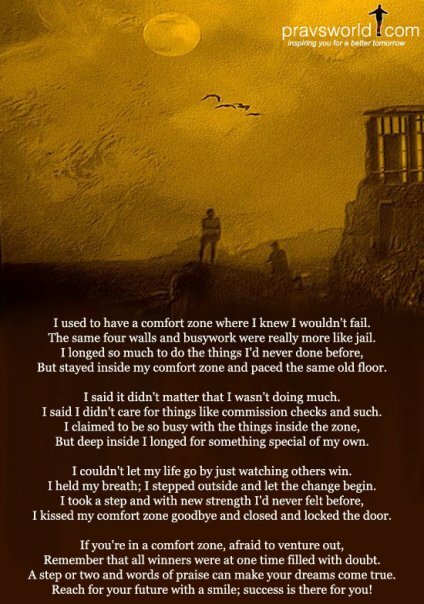 Yes I am in my comfort zone . Could very well relate to your first poem . Oh great you having fun with the tests !